An impressive tale of the Black Templars, led by Grimauldus, in their defense of the hive city Helsreach from a massive ork invasion. Aaron Dembski-Bowden writes these characters expertly, presenting them as a prominent Space Marine killing force against the orks, yet making them seem conflicted and caring at the same time....no easy feat. 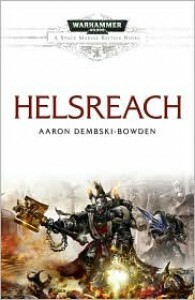 As usual, the death and destruction are off the charts on both sides, but there is plenty of heroics to go around.....a definite must for Warhammer fans.